Moto Guzzi Breva 1200 Sport – Day 7 – Time with the Suspension. This is the seventh in a series of posts about life with the Moto Guzzi Breva 1200 Sport. The previous post is here. When I received the Breva, it was obvious that a previous rider had really clamped down the suspension and then proceeded to wring it out. The bike takes a big lean and really digs into turns much deeper than you think possible. Just keep on pushing on the bars, and the bike comes down — add throttle, lean, and you can really go deep and fast, much further than my limits. I do a lot of riding on Los Angeles’ freeways, and as such, the concrete slabs and joints had my teeth rattling to a point that I finally started to dig in and see what I could do about softening up the ride, and making the big, irregular surfaced sweepers much more manageable. The first thing I went after was the rear suspension; it has a big dial that says SOFTER/HARDER and shows a direction to turn for such. I turned it one click softer and rode, but it didn’t help much. Finally dialed in two clicks and it became much more manageable. Continue reading Moto Guzzi Breva 1200 Sport – Day 7 – Time with the Suspension. Posted on October 16, 2008 Categories bike reviews, Choosing a motorcycle, MotorcyclesTags Breva, Breva 1200 Review, Breva 1200 Sport, Compression and Rebound, Guzzi Suspension2 Comments on Moto Guzzi Breva 1200 Sport – Day 7 – Time with the Suspension. This is the sixth in a series of posts about life with the Moto Guzzi Breva 1200 Sport. The previous post is here. 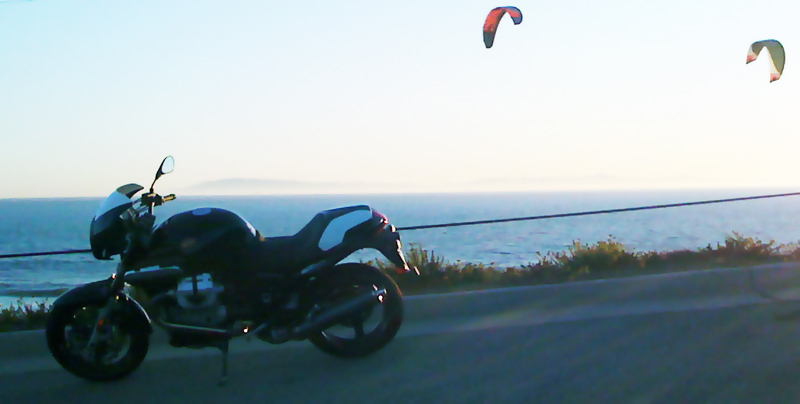 On Day 1 I wrote about my ride up from the Moto Guzzi Press Bike Parking area to my work in Santa Barbara and back home. The posting covered the characteristics of the bike and my first encounters with heavy traffic. What I didn’t write about was the BMW 5-series that changed lanes in front of me, causing a low-speed high-side onto the pavement. There I was, on Los Angeles Avenue in Moorpark, inching between lanes at a red light. I saw a BMW jerk like he was going to change lanes or cut me off, so I grabbed a handful of brake and began to slow to a crawl, taking advantage of the Guzzi’s incredible low-speed characteristics. At that very moment a half-space opened up for the Beemer and he just jerked into it, causing me to panic stop. I was over on the paint stripe with less-than optimal tires — I stopped the bike — the rear wheel skidded and I went high-side over to the right. A guy in a pickup stopped to help me get up. The BMW was gone by the time I had my wits about me. I don’t know if he had done it on purpose or not, and nobody got a license number. Just in case anyone is curious, a cager purposely turning into someone on a bike that is splitting lanes in California wil be charged with Attempted Murder/Assault with a Deadly Weapon. If you do this and get caught, you can probably plead it down, but you’re going to be out thousands of dollars in the process. This is the fifth in a series of posts about life with the Moto Guzzi Breva 1200 Sport. The previous post is here. A buncha miles down. What details of the Breva Sport do you like or hate? Having lived with a 36-year-old Eldorado Transmission for nearly a year and enough miles to really say that I know it, I had high expectations for the 6 speed on the Breva. I’m not disappointed. It is very smooth. It shifts like it’s supposed to. I don’t miss-shift except when I forget it’s a UJM pattern and not the reverse, GP-style shift that my personal bikes have. Neutral is accurate and easy to find, and I haven’t felt any false neutrals between gears. The only “nit” that I would pick would be what seems to be some of lash in the transmission and drive train. When I’m moving from acceleration to deceleration and back, there’s a little “take up” as the throttle is applied that takes a little getting used to; i.e. if you’re decelerating into an apex and then just dump the throttle, you’ll get a little “wobble” when the motor catches up with the rear wheel. I adjusted my technique and this became less apparent. This is the fourth installment in the series. The previous article is here. I woke up late Monday Morning, nursing the remnants of a chest cold. After drowning it with a couple of cups of coffee, I showered and threw my gear on for the 90-mile ride to work. Bopping out the door and into the garage, the Breva 1200 waited, and I was ready to put my regular commute to the test, comparing this ride to my Ducati ST2, and other days when I take the ’72 Eldorado. The cavernous tank of the Breva had served me well, but after 200 miles of weekend jaunts it was on fumes. I hopped over to the Mobile station across the street and stuck some gas in it, cursing that I had forgotten the mileage so I wasn’t able to get an exact MPG value — I’ll do this later I promise. This is the third installment in the series. The previous installment is here. After two weeks of solid riding every day, one rain storm and a possible job offer that would require a move to Chicago, I capitulated to my wife, Sheila, and stormed our house, cleaning out all the junk and stuff that I would not want to take on a move. Benefits include a garage with enough room to park the bikes, a happy wife, and some time at the end of the day to tweak the bike’s suspension settings, go through the technical specifications, and jot down some thoughts with respect to what I would want in another bike (and who doesn’t want more bikes!) if it were to be my “go-to daily rider”. Moto Guzzi Breva 1200 Sport. A Bike for "The Most Interesting Man in the World"
I get a kick out of the Dos Equis Beer Commercial with “The Most Interesting Man in the World”. OK, so maybe it’s tongue and cheek, but I thought I would elaborate on it a little. What would this guy be all about on two wheels? He’d be someone with nothing to prove to anyone — every ride is his own. The enjoyment of speed, implementation of technique, the sensations and mental stimulation. This, in my mind, is howhis (or HER) two-wheeled passion is assembled. This Most Interesting Person would choose a bike with duende; the emotion, expression and authenticity to match their taste and soul. Moto Guzzi USA was sincerely kind enough to loan me a Breva 1200 Sport for 10 days. I will be logging my regular routine on the bike, 160 miles per day of riding from Northridge to Santa Barbara and Back, along with a few meet-ups with friends on weekends and some week nights. Continue reading Moto Guzzi Breva 1200 Sport. A Bike for "The Most Interesting Man in the World"
Posted on October 3, 2008 Categories bike reviews, Choosing a motorcycle, MotorcyclesTags Breva, Breva 1200 Sport, Extended test, Guzzi Review, Moto Guzzi, New Guzzi4 Comments on Moto Guzzi Breva 1200 Sport. A Bike for "The Most Interesting Man in the World"